Our natural soap bars are made from scratch using our own recipes. We handcraft the soap in small batches using the cold process method for a natural cleansing experience. Our oils are minimally heated to retain their skin-nourishing qualities. We use only natural ingredients, ethically sourced and skin-loving vegetable oils of high quality like olive, coconut, castor, avocado, rice bran, sweet almond oil, organic raw shea butter and of course lots of love, (never premade soap bases, detergents, preservatives, or sulfates). No palm oil in our soaps due to its unsustainability and environmental concerns. 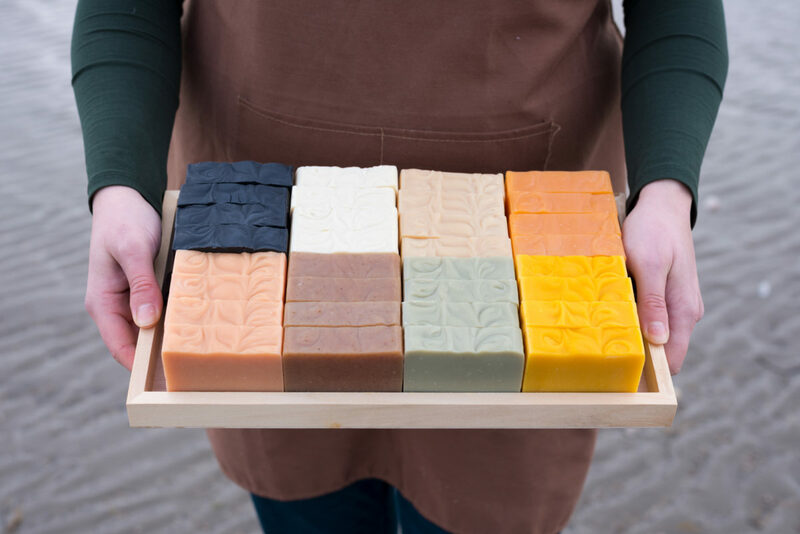 We only colour our soaps with natural plant colourants, cosmetic-grade clays and spices, so our soaps are aesthetically coloured by nature itself; we don’t even use micas or oxides to colour soaps. Only pure essential oils are used to scent our soaps (never synthetic fragrance oils). By combining naturally occurring ingredients we make beneficial products. All our clays soaps are left unscented to better suit the needs of people with different types of skin and skin conditions as clays fortify the soaps with their own skin benefiting properties. We offer different soaps for sensitive, oily, combination, normal, dry, acne-prone skin, itchy, irritated skin. Three Hills Soap is inspired by the rich simplicity of nature and therefore we like to keep our products simple but beneficial. We are proud to call ourselves cruelty-free by choosing ingredients that do not contribute to the cruelty of other living things. Three Hills Soap is also committed to Eco-Friendly Green Packaging as we minimise packaging materials, we use materials that have a little environmental impact, use materials that can be recycled by our customers and we re-use materials we have received. (the greenest) post-consumer waste. This paper is not dyed or bleached using any chlorine, the colour is achieved by matching raw waste materials. The packaging is 100% recycled, recyclable and compostable. The paper cigar wraps packaging is fastened with a seal which is made from cellulose and is fully biodegradable and compostable. As mentioned earlier, our soap is made using the cold-process method which creates a biodegradable soap bar with zero by-products. The only by-product of soap making (saponification process) is vegetable glycerine which has great moisturising properties. Energy consumption is also kept to an absolute minimum – every single bar that makes its way to your doorstep – and hopefully into your daily routine, is lovingly poured, cut and wrapped by hand. Proudly made in Dublin, Ireland, we’re bringing you a fabulous vegan, palm oil free, natural soap that is skin – friendly, animal- friendly and earth – friendly. Hi, are you stocked in any shops in Dublin?